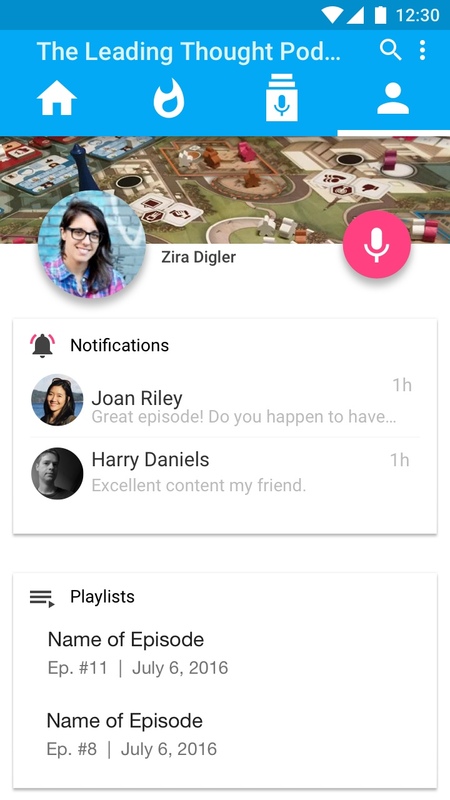 Google doesn't yet have a podcasting app, and in an effort to compete and capitalize on the steady growth of podcast listening, a team of fellow DevMountain students and I were given the job to conceptualize a Google podcasting application. 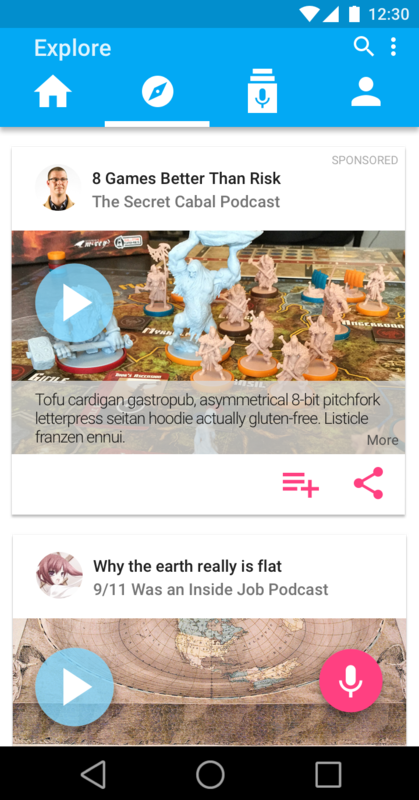 A two week design sprint with classmates, this project focused on Material Design and the ability for podcasters to easily monetize their craft. To begin, our group unpacked our task, gathering as much information as possible about podcasting, brainstorming potential interview subjects, and devising an interview guide. We chose to interview both content creators and podcast listeners. We wanted to understand their behavior not only in relation to their podcast listening/creating, but as to their subscription habits elsewhere online (would they be willing to pay for a service, or would we need to integrate ads using AdSense? ), what they do for work (could podcasting become a viable career for any of our creators? 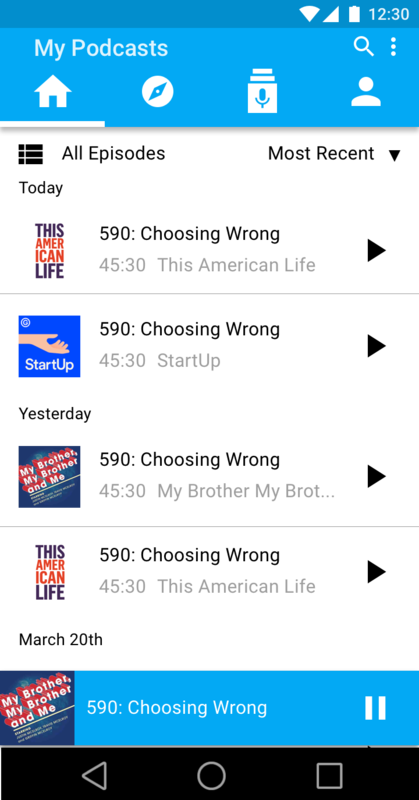 ), and what kind of goals they have (why do they listen to/make podcasts?). 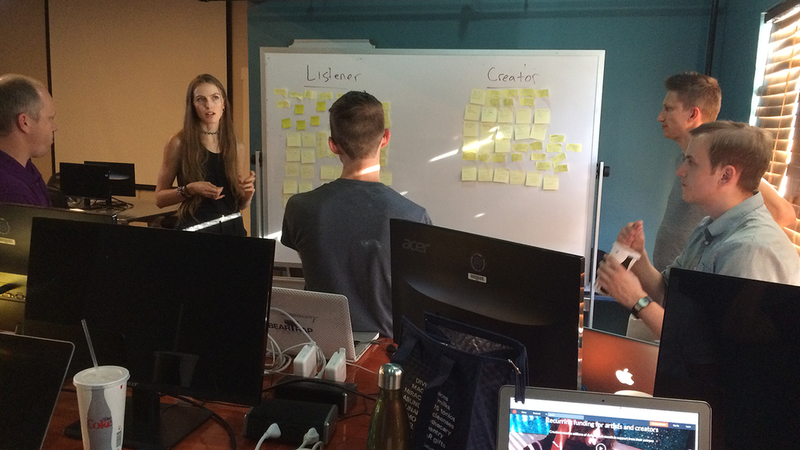 Team brainstorm for user interviews, featuring Bradley at the whiteboard. 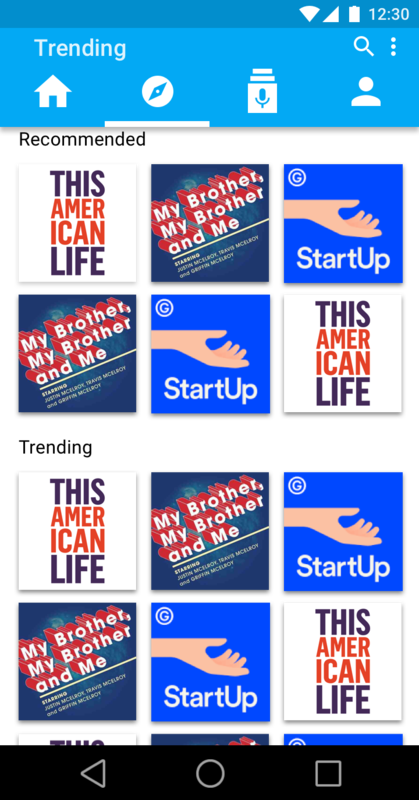 I interviewed an upper middle-class father, thirty-four years old, who works in the tech industry, holds a college degree, and listens to approximately eleven hours of podcasts per week. He listens to podcasts because they're interesting, saying, "I feel like I’m getting something valuable from them. The ones by NPR are really good, because I feel like it’s time well spent. I’m learning stuff as I go. The other ones are kind of like junk food, if I listen to them too long, I feel like I do when I eat too much barbecue." He listens to them when he's performing otherwise habitual tasks, primarily driving and working out. He wouldn't pay for a subscription, but doesn't mind customary podcast ads when they feel native to the content. He would be annoyed and feel cheated if he paid for a subscription and yet his podcasts still had ads, saying, "I’d feel like they were double-dipping me." He listens via the Apple Podcast app, and discovers new podcasts via the Most Popular tab and native ads that tease content from the rest of the podcast channel. I also interviewed a podcast creator who regularly works on three different comedy podcasts. 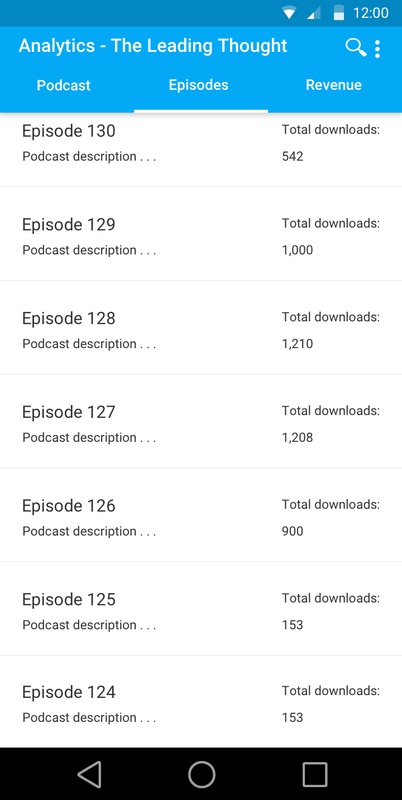 His small team (of two people) uses LipSync to host their podcasts- they pay a $5 fee per month, and the app sends their podcasts to an RSS feed, iTunes, Stitcher, and their website. As he says: "it's almost too easy." They used to track their users (which is a higher monthly price), but they prefer to interact with their listeners via social media. The creator started podcasting "as an excuse to have time to see [my brother] and catch up... we’ve just kept doing it." They don't see it as a potential career, but as a creative outlet. Their revenue model is "very guerrilla." They record a show, and post bonus episodes and exclusives to their Patreon [a subscription service based on donations for episodes], setting a monthly donation limit. Our podcasting platform helps content creators who want to increase ROI by simplifying content management and increasing revenue and audience engagement. On our own, we designed wireframes and prototypes using Material Design for both the home screen and our assigned features. These included Recording and Uploading, Library/Content, Analytics, Promotions, and Notifications. I was responsible for Notifications. We chose a direction and color scheme to focus on, and reiterated our prototypes to start aggregating our screens together. Our teammate Jacob Russell created branding assets, including our logo, and edited final elements of our screens to unify the design, and Marvin Nelson put together our Marvel prototype. We set out to test our app's usability with our product manager, Jay, and our lead DevMountain instructor, Britton. For the first task, we asked them to record their first podcast episode. This was not as direct an experience as we'd hoped. Both the Explore and Promotions features were confusing and unclear, and distracted one user from the task, going to his Library before finding and pressing the Record button, which we'd intentionally placed prominently (or so we had thought) on two primary screens for easy upload. The other user found the Record button more easily, but was confused by the audio files and upload options. We also asked our users to see how their most recent episodes were performing. Instead of choosing the Analytics tab, one user went to his Library. There was no easy way to navigate back to Home from the deeper analytics, and the Navigation changed too frequently. The Analytics were hard to see and digest, requiring better visual hierarchy. Working as a team was awesome, as collaboration and cooperation were vital to our process. Learning how and when to compromise or stand up for certain ideas, users, or concepts was really valuable, and as any former team athlete knows, we all needed to be successful individually to succeed collaboratively. Utilizing each team member's specializations and strengths meant we were stronger together. Our "Library" would more appropriately be changed to "Feed" or "My Episodes"